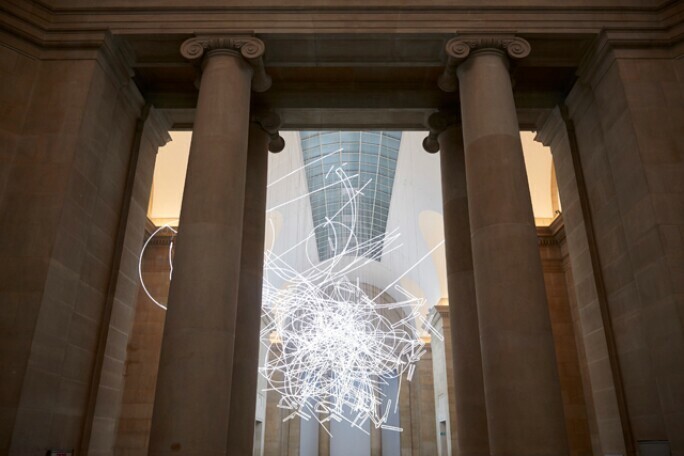 With two kilometres' worth of white neon tubing arranged in dazzling arrays of lines and curves high above the Duveen Galleries' polished floors, Forms in Space… by Light (in Time), Cerith Wyn Evans's installation for this year's Tate Britain Commission (which is supported by Sotheby's) cannot be mistaken for another artist's work. Born in 1958 in Llanelli, Wales, and now based in London, Wyn Evans has long grappled with light, whether it be a young filmmaker or as a mature artist beaming Morse coding of Welsh literature into the night sky at the 2003 Venice Biennale. He is also participating in this year's edition of the Biennale, curated by Christine Macel, showing his film Pasolini Ostia Remix, 1998–2003. On an all-out quest for meaning and connection, Wyn Evans interrogates everything from art history and philosophy to musical scores and celestial bodies, translating his findings and visions into such forms as the muticoloured Murano glass chandelier Astrophotography...The Traditional Measure of Photographic Speed in Astronomy...’ by Siegfried Marx (1987), (2006), which flashes his personal literary canon in code. Days before the Tate Commission's unveiling, Tony Guillan sat down with Wyn Evans to discuss his life, his work and the cosmos. 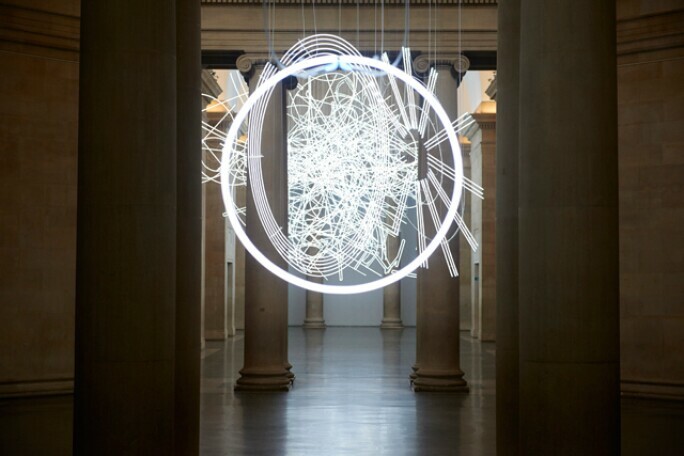 CERITH WYN EVANS, FORMS IN SPACE...BY LIGHT (IN TIME), 2017. 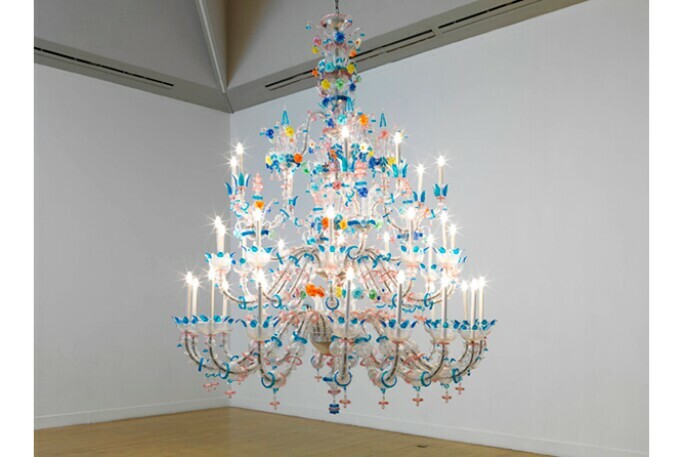 © CERITH WYN EVANS. PHOTOGRAPHED FOR SOTHEBY'S BY JAY FENWICK. Tony Guillan: When you moved to London in the 1970s, the Surrealist-oriented Conceptual artist John Stezaker was one of your tutors at Central Saint Martins. Can you talk about his influence? Cerith Wyn Evans: Absolutely. John was so generous with his time and his encouragement, and he really lit the fuse of my enthusiasm. My time with him was spent in his office or in the library, and he would say, "Have a look at this." He introduced me to film theory, feminist literature, French philosophical thought and aesthetics. We read Beckett, Walter Benjamin, the Frankfurt School and Proust. TG: After St Martins you studied at the Royal College of Art, then went to work as an assistant for filmmaker Derek Jarman. Can you tell us about that time? CWE: Derek lived opposite Saint Martins and I used to see him around all the time. He would have tea every afternoon at Patisserie Valerie on Old Compton Street. I didn't have any idea of what he had done. When I left St Martins I was making films with a friend of mine, and Derek introduced me to Archie Tait, who was just starting up the Cinematheque at the Institute of Contemporary Art [ICA]. And so it came about that in 1980, I had my first show at the ICA in the brand-new Cinematheque. At the time there wasn't the fluidity that a young artist would feel now. You couldn't be a sculptor and a filmmaker at the same time. You were either a filmmaker or you were sculptor. There were more rigidly policed boundaries. TG: In this commission for Tate Britain as in your most recent show at White Cube gallery, you mention Japanese Noh theatre as an inspiration. Why? CWE: It is a sort of springboard. John Cage said to Morton Feldman at one point: "Take the first note, Morty, and use it as a springboard into the next." Noh is kind of the first note. We are leaving the south Duveen Gallery almost completely empty apart from one little figure, which acts as a spyhole and a "you are here" arrow, a portal through which you start the journey. TG: You use light and sculpture to change the way viewers experience space. Are you also exploring what interior space feels like? CWE: I'm able to use the sculpture in the Duveen Galleries as a kind of stage. I am very fortunate that, in parallel, there is the retrospective of works by David Hockney. It is a good hinge for exploring alternative ways of seeing and the art of the 20th and 21st centuries. The question is really: How art now? How art next? Where do we need to be looking? What is going to enable us to be in a better position to draw a map, to open new spaces for experience? 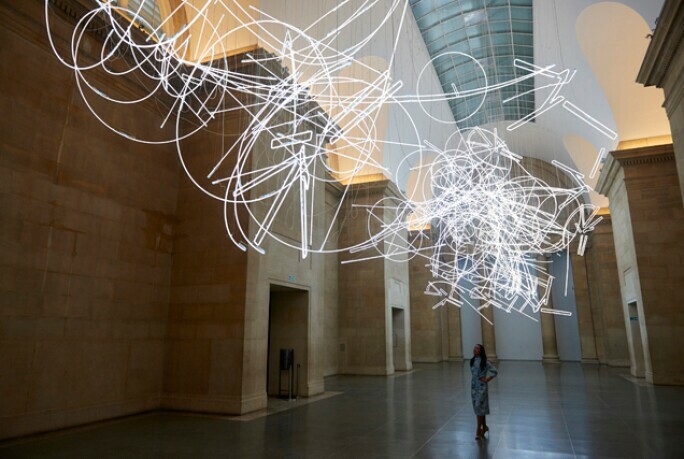 CERITH WYN EVANS, NEON FORMS (AFTER NOH I), 2015. © CERITH WYN EVANS. PHOTO © WHITE CUBE (GEORGE DARRELL). TG: Is the context of an installation essentially part of the content for you? CWE: Yes. In a way, context and content are insufficient as terms, just like subject and object are as well. You want to try and somehow fill one through the other in order to get to some kind of synthesis. This piece at the Tate is very much a celebration of that, as much as it is a fanfare toward the idea of context and an enquiry into modes of perception. 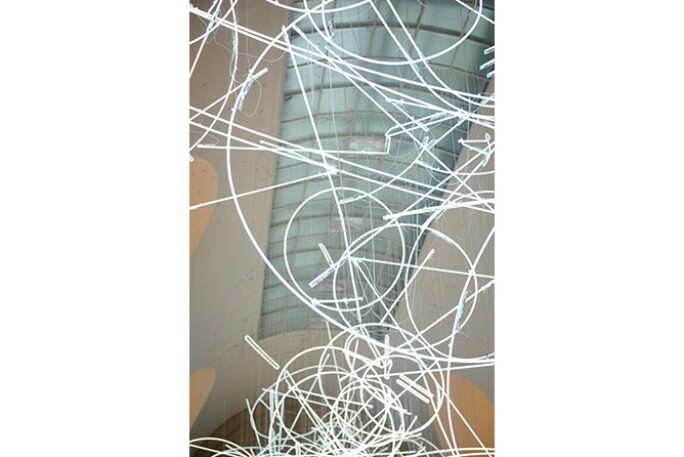 CERITH WYN EVANS, ASTROPHOTOGRAPHY...THE TRADITIONAL MEASURE OF PHOTOGRAPHIC SPEED IN ASTRONOMY..., BY SIEGFRIED MARX (1987), 2006. 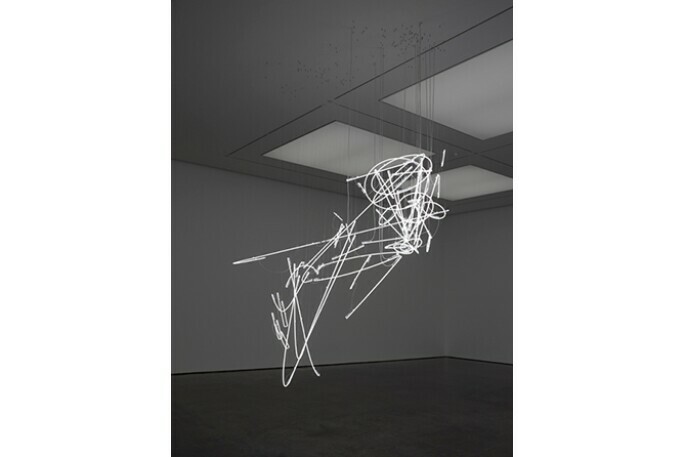 © CERITH WYN EVANS, COURTESY JAY JOPLNG/WHITE CUBE, LONDON. TG: You have said your work is not biographical, but one of your pieces includes a photograph of your father. What is your attachment to that photo? CWE: The most important thing wasn't that it was his photograph – it was my relation to the history of that photograph in my life as an image. I was interested in the idea of using a screen that was already loaded up with another image. So I created a kind of superimposition, where a moving image is being projected on a barely visible image that already exists. The image was printed in silkscreen, in silver on silver. So it has this strange quality of barely being there. Works tends to act in concert with other works, so installations for me are very much vehicles for reading one piece through another. It is important for me to make works that are difficult to photograph because reproductions usually let you down. Many things have a presence and influence on how you perceive art: nuances in temperature; the time of day; how the light falls into the room; whether the show is free or not; where it is being held. These things seem irrelevant, but in fact have enormous impact on what you take from the experience and how long the experience is allowed to keep working.